Co-signing is when someone agrees to be jointly responsible for a debt with another person. This is different from signing a guarantee, which is a promise to pay the debt of another person if they default on the debt. Client has been asked to be a “co-signer” for a debt and wants to know what legal responsibilities are involved. Client co-signed a loan and wants to know their rights because the other party defaulted and the creditor is demanding payment from the client. Client and spouse have separated, and the client wants to know what to do about joint debts, such as credit cards. Client wants you to explain to someone else what it will mean to co-sign a bank loan for the client. This area of the law is complex. The extent of client responsibility can turn on fine distinctions of law, as can the availability of legal defences. A considerable body of statute law and case law governs the creditor and debtor relationship when there is more than one debtor in a credit obligation. The following is only a brief outline of the basic principles. Consult a lawyer for an opinion in specific cases. Co-signing is the popular term for someone agreeing to be liable (responsible) for the debt of another person. In law, there is an important division in the responsibilities of people who co-sign. In general, when two or more borrowers contract to receive and take the benefit of credit, they are known as joint debtors. They are each fully and independently responsible for the debt. Technically, creditors usually ask joint debtors to be “jointly and severally” liable (each person is responsible for the entire debt). This gives the creditor certain advantages if the debtors default and the creditor attempts to collect the whole judgment by making separate settlement arrangements to collect part of the judgment from each debtor. There are many situations in which people are asked to be joint debtors, such as when two spouses take a mortgage to buy a house, obtain a line of credit to buy a car, or request credit cards from a bank. If a borrower applies for credit and the lender demands that someone else promise to be responsible for the debt if the borrower defaults, the borrower is called the “principal debtor” and the other person is called a “guarantor”. Most commonly, relatives or friends are asked to be a guarantor for a borrower who cannot obtain credit on the strength of their own financial record. The borrower may have a limited income or assets, or may have a poor credit history (see the section on Credit Reports and Credit Ratings). In business, individuals who are principals in a company are often asked to be guarantors for the debts of the company. In most instances, creditors specify which type of contract they want the parties to sign and there may be relatively little to negotiate. The law will usually, but not always, follow the express intention of the parties when considering the liability of joint debtors or guarantors. The law distinguishes between credit contracts with jointly responsible debtors and credit contracts with a guarantor, but if there is a default in either case, the creditor has a right to claim against anyone who contracted for the debt. There is little joint debtors can do to avoid a debt completely or to legally shift liability to the other debtor. The law does not care, for example, if one party’s income is higher than the other’s or if the debtors have agreed between themselves who will pay off the debt. Debtors cannot bind a creditor to a contract to which the creditor has not been a party. This is especially a problem when spouses separate and one spouse promises to pay off certain debts as part of a separation agreement. If that spouse defaults on paying the debt, the creditor can still sue both spouses. There are particular problems for joint debtors with credit cards. Usually, the credit agreement between the parties and the creditor calls for each debtor to be fully responsible for all credit obtained through the card. A guarantor’s responsibility for a debt only comes into effect if the principal debtor defaults on an obligation. The law allows certain defences and remedies for guarantors that are not open to joint debtors. The most significant defence principle says that if the creditor and principal debtor make significant changes to the detriment of the guarantor in the credit contract (before or after the principal debtor’s default), then the guarantor may be able to get out of paying off the debt. For example, if a creditor lowers the monthly payments for a principal debtor having trouble making the full payments called for under the loan agreement, the creditor may wait a long period after default to start legal action against the guarantor. The courts may find this prejudicial enough to the guarantor to disallow the claim against the guarantor. In some instances, a guarantor or joint debtor may be able to argue that common-law defences, such as unconscionability (explained in the section on Contract Defences), should apply to their circumstances. In Bank of Montreal v. Koszil, the court found that a guarantor (a common-law wife) who had not received independent legal advice, and who was not fully aware of her common-law partner’s financial predicament before signing a promissory note (an enforceable promise to repay a debt or loan) and mortgage, was the victim of unconscionability. The action against her was dismissed. In Toronto-Dominion Bank v. Wong and Lim, however, the court found that a mother, as joint debtor, was responsible for her son’s debt even though it was clear that the benefit of the loan went to the son, and that the mother had not received independent legal advice. The court found that agreeing to sign the loan showed imprudence, but not unconscionability. A common client concern about becoming a guarantor is the apparent unfairness of being responsible for someone else’s debt when little or no benefit has gone to the client. The client may complain, “My friend got all the money.” Unfortunately, this does not often translate into a defence or remedy for the client. 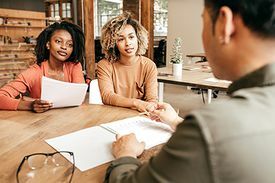 Even though the guarantor gains no monetary benefit from guaranteeing a loan, the law usually still finds legal consideration in this relationship. The benefit to the creditor is the guarantor’s promise to pay, while the benefit to the guarantor is the satisfaction that the principal debtor got the loan from the creditor. The most important aspect of fact gathering for co-signing situations is to get copies of all the parties’ credit agreements. A lawyer must review the agreements to determine the client’s legal obligation. You must also get full details of the circumstances surrounding the credit contract, including discussions between debtors (for example, spouses) and discussions between the client and the creditor. Situations involving joint debtors (or a principal debtor and a guarantor) often include potential for a conflict of interest. Be careful about advising more than one debtor in any multiple debtor obligation. It may be wise to deal with only one of the debtors, particularly if one or more of the parties did not receive a direct benefit from the loan. Consider seeking advice from a lawyer about the potential for conflicts, even if the joint debtors are spouses. There may be defences against the creditor for some or all of the amount due, or there may be remedies against the other debtor. When liability and the amount due have been confirmed, review the full financial circumstances of the client. Consider comprehensive remedies if there is more than one creditor. Immediate lump-sum payment (for example, 25% to 50% of the full amount owed) in full satisfaction of the debt. Immediate part-payment (for example, 5% to 10% of the full amount owed), coupled with instalment payments to make up the balance to somewhere between 25% and 50% of the full amount owed. Creditor promises to release the client from liability on the debt when instalment payments totalling an agreed percentage of the full amount owed are reached (for example, if regular instalment payments are continued until 50% is repaid). Also see People’s Law School’s page on co-signing or guaranteeing a loan. This page was last edited on 13 October 2018, at 08:54.